For many families, the kitchen is the biggest, busiest room in the house. This makes the kitchen design and layout especially important. If you want to create an effect that is visually balanced, your best bet is to work to maintain symmetry throughout the kitchen. This method can make your kitchen look neater, rather than make you feel as though everything is always out of place – even if it isn’t. If you have one, giant light fixture hanging overhead, it can make your entire kitchen feel out of balance. Instead, consider using two matching lights to create a more symmetrical appearance. Not only will it help add more light to the kitchen, it can make your entire kitchen seem more balanced. If you do need to use a single fixture, ensure that it’s centered to give the room a cleaner appearance. Symmetry in lighting is also important for work area lighting and the light that flows in through your windows. Find a way to balance a big window at one end of your kitchen: maybe try hanging a mirror at the other end or incorporating task lighting that will light the other end of the kitchen. Storage space is one of the most important aspects of any kitchen. After all, you need plenty of room to neatly store small appliances, hide food and ensure that you aren’t leaving a big mess on the countertop every day. Make your storage symmetric by balancing your cabinets. For example, have you installed an open shelving unit? With two, you can add symmetry to your kitchen, as well as uncover more storage space. Don’t forget about the cabinets. While kitchen cabinets can be challenging to balance perfectly, using cabinets that are all the same height will help keep the room balanced appropriately. In the kitchen, consider a set of matching bar stools, and make sure you have at least two or in a group, not just a single stool. In the dining room, balance seating around the table. You’ll be surprised by how much more comfortable this symmetrical appearance feels when you have dinner guests. At the end of the day, creating a kitchen that is full of symmetry can create a peaceful, relaxing space that feels much more balanced. 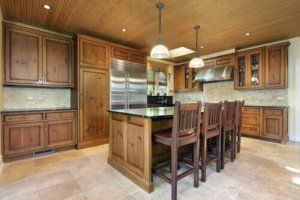 At Republic West Remodeling, we are committed to providing a great experience to you throughout the entire kitchen remodeling process, including offering a wide range of kitchen remodeling tips. Contact us today for details.